We have qualified contractors standing by to help you. Talk to one today by filling out the quote form on the right. These should not be installed close to the ground where moisture might wick up behind them. If there is soil build up around the bottom of the wood siding it should be removed. Shakes and shingles will fade overtime. Shakes and shingles can be painted or stained to help preserve them. Depending on the climate, painting may have to be done every 57 years and staining may have to be done every 3 years. Wood planking will have to be painted. Again, it depends on the climate how long between paintings. Composition board or hardboard needs a good deal of TLC, especially in wet climates. Composition board must be repainted more often than other wood sidings because it doesn’t hold paint as well. If left exposed too long, the board will absorb moisture, expand and bow out. Unlike solid wood, which will shrink after it has expanded, hardboard will not. It may actually disintegrate. "Traditional wisdom says not to judge a book by its cover, but a home is a different story. A home's exterior has a lot to do with its perceived value, and achieving a high-quality appearance often starts with siding..."
Receive our "Insider’s Guide to Siding" with your request! get help from a contractor below! 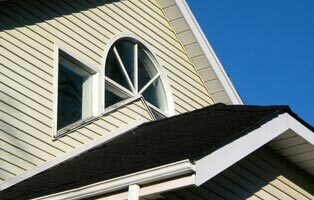 Why are you shopping for vinyl siding?